Be sure to check out our calendar of events page. It lists all of our upcoming things to do at the brewery. Pretty exciting stuff. GROWLERS AND FILLS! Stop by any day of the week and pick up a growler. 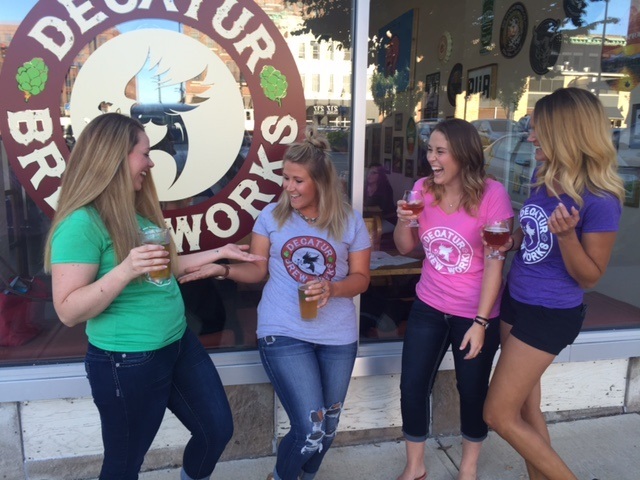 Check out our new ladie's t's! They come in a bunch of different colors and sizes. Stop in for one today! Like drinking the 101 IPA? Take home a t-shirt too! Hell's Hollow comes in a couple different versions. But the most popular by far is our Vanilla Porter. Chocolate, roast and vanilla abound. One of our flagship beers, D-Town Brown is a very approachable, easy drinking brown ale. Afraid of dark beers? Fear no longer! In addition to our beers, we also have serve beers from all over the world. 24 taps offer a wide variety!